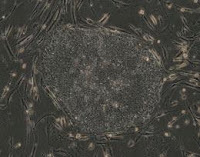 Stem cells hold great promise for medical research, but their use are very controversial because of their primary source: cell lines cultivated from fetal tissue. In the first in a series of experiments, the researchers grew individual immune cells, switched on their reprogramming genes and allowed them to continue growing and dividing. The team monitored how quickly the cells divided, and at what stage they began to produce a chemical signal that indicated they had become iPS cells. From time to time, the authors also checked some of the cells to make sure they really were pluripotent — for example, checking whether they could form teratomas, a type of tumour made up of many different kinds of cell. Some of the cell populations began to signal after just two weeks. Others took longer — up to 18 weeks — but only 8% of the populations failed to generate iPS cells by this time. "Essentially, all cells have the potential to become pluripotent," Jaenisch says. That's a huge milestone that has been reached, folks. And one that should please just about everybody. I ain't been too keen on a lot of stem cell-based research either, on grounds of where most of the material has been coming from. Based on these findings, there could be some incredible medicine heading our way.